Last week posted a review of "Smoked Colorado Beef" from Bruce's Jerky. I wanted to follow up with this review of their Smoked Hot Beef. Bruce's Jerky is actually a smoked fish shop located in Tawas City, MI, but they seem to sell a lot of beef jerky. Their jerky is actually a private labeled product manufactured by Michigan Brands, Inc., out of Bay City, MI. Michigan Brands focuses on a private labeling program through several small outlets across the country, similar to Bruce's Jerky. They marinate their beef for a full 24 hours before hanging them up for smoking. 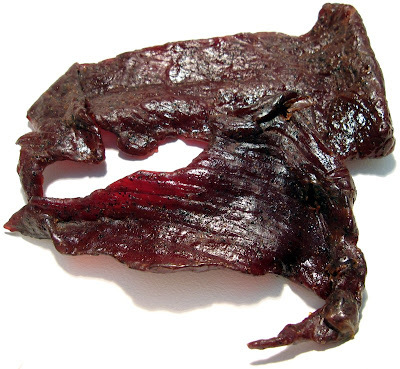 On Bruce's Jerky's website, this hot beef jerky is actually pictured as a strip-style jerky with large pepper corns. However, the package I received is a slab-style sprinkled with fine ground pepper. The photo on Bruce's Jerky's website looks far more appetizing, making this slab-style jerky something of a disappointment. I'll have to reserve judgement until I actually eat this. Beef, brown sugar, salt, sugar, spices, onion, sodium erythorbate, garlic, sodium nitrite. The flavors I get from the surface of these pieces starts with a faint sweet flavor, and a spicy tingle starts to build. In the chewing what I taste is a good deal of salty flavor, a faint garlic background, and a light natural meat flavor. For being a hot variety, it definitely does generate a spicy burn, probably what I'd rate as medium on my hot scale. But a spicy burn is about all I'm getting, I don't pick up any kind of flavoring associated with it. Largely what I taste from this jerky is this slight sweet flavor off the surface, which gives way quickly to a strong saltiness once I start chewing. It's further enhanced by the spicy burn, and a tad bit of garlic. Even though there's a lot of ground black pepper visible on these pieces, I don't really taste a lot of it. It probably only has a slight flavor. But mostly, this jerky is defined by that initial slight sweet, the strong salty flavor in the chew, and medium level burn. As for the natural meat flavors, it's a light flavor. I can pick up bits of that taste, but I think the saltiness drowns much of it out. It seems like this Smoked Hot Beef variety from Bruce's Jerky tastes pretty much like their Smoked Colorado Beef, except with the added spicy burn, and a bit more of an initial sweet flavor from the surface. These appear to be slices of whole meat, sliced to a medium to thick thickness, and in medium to large sized pieces. 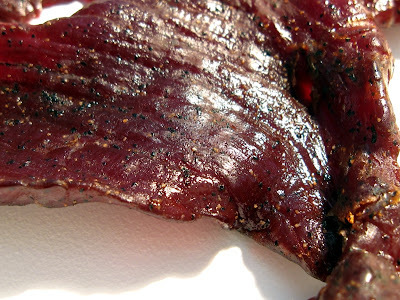 This is a moist jerky with quite a bit of moisture on the surface, less so inside the meat. Tearing pieces apart with my fingers seems easy enough to do, and chewing seems easy also. The chewing texture is quite good, having a steak-like feel to it, cooked medium. The texture seems best when pieces are eaten straight out of the bag while still wet. If allowed to sit in the open air, they dry out quickly and feel more well-done. I'm not getting any mushy, crumbly, or gummy texture. Because these pieces are quite wet on the surface, the leave a lot wet stickiness on my fingers, requiring a licking and wiping on my jeans before touching the keyboard. But they don't drop any tiny fragments when tearing apart. Most pieces seem to have one or two sizeable bits of fat, and they do add to the flavor of the jerky, though nothing rancid. But I found no tendon or gristle, and now unchewable wads of membranous tissue remaining in my mouth. Bruce's Jerky sells this Smoked Hot Beef from their website at a price of $25.00 for a 16oz package. You can't buy this in any smaller size. I actually bought this package, along with a 16oz package of their Colorado Beef, for a total of $50.00. Add to that $11.95 for shipping, and it came out to $61.95 for 32 ounces in all. That works out to a price of $1.94 per ounce, putting this into the average price range, but on the border with expensive. For general jerky snacking purposes, at the $1.94 per ounce price, it presents a fair value. I get a good deal of snackability mostly for its great meat consistency and chewing texture. The flavor of this jerky is not necessarily all that snackable, however. As a hot beef jerky, also at the $1.94 per ounce price, it's presents a good value. I'm definitely getting a good amount of spicy hot burn, but what I'd rate at a medium hotness. But combine it with the great meat consistency and chewing, it's a good jerky to have if all you want is a hot beef jerky. Like with Bruce's Smoked Colorado Beef, I really like the meat consistency and chewing texture, but the flavor is too salty for my preference. I actually want to keep sinking my teeth into this jerky, but the heavy salty flavor wears me out. Even with quite a bit of ground black pepper visible on these pieces, they don't really provide much flavor. The natural meat flavors are too light to rise above the saltiness. And also like the Smoked Colorado Beef, the size and thickness of these pieces, along with the heavy moisture, creates a lot of snacking anticipation, which may perhaps heighten your enjoyment. This has the appearance of a juicy, tender, flavorful jerky, and it is exactly that, it's just the flavor is mostly salt. A good beer to pair up with this is a creamy smooth stout, but a Blue Moon Apricot Ale keeps sounding good too.